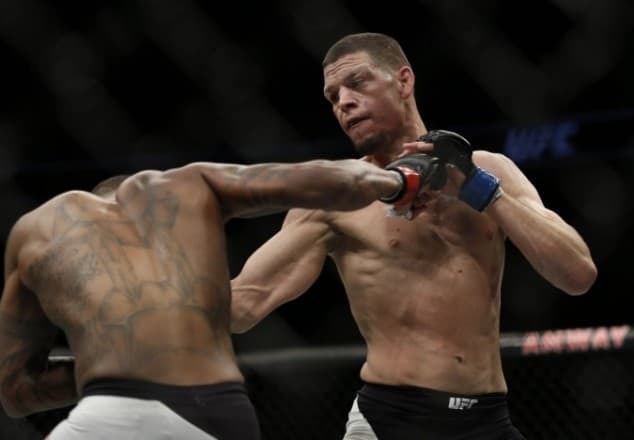 Popular lightweight bad boy Nate Diaz somewhat surprisingly returned with an impressive unanimous decision win over No. 6-ranked Michael Johnson at tonight’s (Sat., December 19, 2015) UFC on FOX 17 from the Amway Center in Orlando, Florida. Without a victory since his TKO stoppage of Gray Maynard at the TUF 18 Finale in November 2013, many thought Diaz would be an easy opponent for the much more active and successful ‘Menace’. But the younger Diaz brother was the exact opposite, peppering the Blackzilian with endless pinpoint one-two combinations to earn the nod on the judges’ scorecards, after which he called out featherweight champ Conor McGregor.